Everyone knows about Google's search engine and it's capabilities. This is one of the most universal search engines and used by more "web surfers" than any other on the Internet. The simplest search is at Google.com but do you ever use the "Advanced Search"? This takes your searches to the next level. Here's a link to their Help Center which gives a great overview on how to use the advanced search options. You won't believe your options! If you want to know who's been to your website or blogs, this tool is a must. Google Analytics helps you to understand where your visitors are coming from and how they interact with your website. What pages they view, how long they're there, and much more. This tool will help you improve your site and strengthen your on-line marketing initiatives. Gmail is a way to have a free email account that you can use for personal or business use. This is a fantastic alternative to your regular daily email account. Tired of spam? Paranoid about entering your email when registering for on-line products, tools and services? Gmail is what I use to filter out my spam, and still have a valid email address for my on-line travels and endeavors. This keeps my business email from getting out of control. Gmail has a very user friendly interface that allows you to navigate easily and quickly. For those of you who may not understand SEO (Search Engine Optimization), you really need to look into this one and try to understand it as much as possible. This can make all the difference in what you decide to put on your website and post on your blogs. The goal (for most) is to have your website or Blog come up first in the search engines without having to pay for it. Understanding how SEO works, then making it work for you gets my highest recommendation. Have you considered making an additional income from your website or Blog? Google will pay you. That's right, pay you to advertise using their AdSense Widget. Make sure you take the time to understand all the benefits and drawbacks of Advertising on your Internet presence portal. Here is their Help Center which will answer any questions you may have. The ads you place on your site can be individually selected, customized, or automatically be chosen by Google based on your content. Thi$ is worth checking out. Brand New! Now you can add maps to your Website or Blog in 3 easy steps. This is an ultimate tool for your web presence as well. You can probably think of at least 10 uses right away that would help in your marketing efforts. I can't think of a better way to promote your location than this. Google maps has a ton of other features that many of you already use or are aware of, and it's also now available for your TREO and cell phones. Here you can search and browse 4500 news sources and web-pages that are being continuously updated. Want to get your arms around what's going on in your area or around the world? Google drops no balls in this area. The beauty of this tool is that, once you decide what you want and need the most in the news, you can use the RSS Feed to have it all brought to you. iGoogle let's you customize your home page to anything you want. If you don't like the news, go out and make some of your own! :-) Now you're in the news! This article is discussing Google's newest brand. iGoogle. It's on ZD Net and written by Garrett Rogers and is titled, "What Google is up to". It's an easy and short read if you want to save some time. I have customized My iGoogle to use as a link in some strategic locations out on the web. This is a great tool for helping you gather and organize the on-line tools you use most. It's your own personal web-page to use for yourself, but can definitely be shared with others...especially clients. It all depends on how you decide to set it up. It's easy to do a search in Google for just about anything on the planet, that's why so many millions of people use it. This tool allows you to have the future delivered right to your email door-step. You can run any phrase or keywords, then be notified if any website, blog, or article is posted with your "Alert" specifications. I just did a post regarding this powerful tool, I hope you'll take the time to read and use this one! "Staying Alerted"
Are you looking to start your own personal Blog? Google's Blogger allows you to create, customize and personalize your "stand alone" Blog and it's FREE! When done properly, you can't even tell it's a Blog, it looks more like a website. You don't need to be a programmer or an HTML code designer, you just have to decide which of the many options to use, to best suit you and your audiences needs. I have 3 personal Blogs that were created using Blogger. This is the Official Google Blog using Blogger. They currently have 842,000 readers subscribed through Feedburner. Imagine having that many people viewing your Blog or Website continuously! If you are looking for posts that relate to anything, for every Country, this is a great Blog to subscribe to. This Blog is so huge, you can't even leave a comment, but you can create a link. I would most certainly check this one out, even if it were to just get an idea on a layout for your own. Why re-create the wheel? This is a quick and simple way to advertise on Google regardless of your budget. This link to the AdWords Help Center will give much more detail than I can possibly post here. You should investigate all these types of tools for your business, if you foresee doing more and using the Internet to do it. I'm not sure of the returns in value for every business, but the successes I have heard and read about are phenomenal. All the Websites you ever visit right at your finger tips. Some of you may not want to use this! I guess that depends on how much you browse the web and where you browse. I use it because I want to track some of the sites I visit for updates and I don't want to use Google Alerts for everything. This is a personal preference, but it seems better to me than having 1000 bookmarks in my Microsoft Internet Explorer or Mozilla's Firefox browser. Each account with Google's Picasa gives you about 1 Free gigabyte of space. That's approximately 4000 standard resolution photos! You can then share them with family, friends, clients and co-workers. You can create albums, add captions, and even comments to your posted photos. Keep them private, or share them with the world. I know there are many other photo applications like Kodak Share, Photo Bucket, Slide, and Image Shack, but Google has it as an addition to ALL these other tools. It's like a One-Stop-Shop! Let's face it, if you haven't heard or used Google Earth, then let me be the first to welcome you to our planet! :) This has to be one of the best services and tools you can incorporate into your business. Find directions, email 3-D maps and areal views, look into outer space, and see who's parked in front of your clients house (just kidding on the last one), I use it almost everyday. Google Earth is a must have for any Industry Company or Professional. Click here if you have any doubt. Here's my favorite 1 minute video on Google Video. I know you'll enjoy this one! This tool is much like Youtube.com video, but it's provided to you by Google. You can email, forward, or add to your posts, blogs, websites and more. The interface is very easy to use and is a great alternative to some of the others out there. Google Video can be quite educational and entertaining at the same time. Try it, you'll like it! This is Google's technology playground. Here you can have the chance to see what Google is working on next, and get the chance to try it out before it hits the Prime Time! They are looking for feedback and suggestions from you! For example, they are working on a prototype which is still in Beta testing; Google Voice Local Search where you can search for local businesses using your voice, from any phone, for Free! Just Dial 1-800 GOOG-411. You should look at Google Labs to see what other products, tools and services they are working on while you're here reading this post! Info when you want it, right on your desktop. Now you can download Google Desktop and search your computer like you would the web with Google, view news, photos, and more anywhere on your desktop, add Google Gadgets and Widgets to customize your Google sidebar, you can even create and share your own gadgets and widgets with others. Great Google features right on your mobile device. Maps, Gmail, Searches and their newest addition, YouTube Videos. This is brand new, you can watch, upload, and share videos right from your mobile device. Also new is the ability to access your Picasa albums and photos from your mobile device. What will they think of next? I'll tell you. I saved the best for last. Google Mobile now allows you to Blog from your mobile device. Take a photo, upload it, create your post, all on the go. WOW! Thank you Google, there's no need to be frugal, since all this stuff is FREE!! Do you Google? Brad - I GOOGLE frequently but you keep coming up with hidden treasures! LOL Thanks for yet another great post. Brad-I use the analytics, and it really helps to see where my marketing is working when it comes to directing trafic to my website. Brad, thanks for the great info. I know some, others I will be learning soon. Great post as usual Brad! I'm bookmarking this and I think this is a prime example of one of the better blogs of All Time! Thanks for the reminder to check out what the silly folks at google are up to. They have some clever tools. Great stuff Brad. Thanks for the exhaustive list. Google is so far and away my favorite. Wow, great stuff here! Thanks for taking the time to pull it altogether! I didn't know about some of these. Thanks for sharing the knowledge! It is a great little tool to see when and how often your site is cralled by google, and a few other interesting things. HI Mr. Google, opps I mean Brad. I use Google desktop and have all the activerain posts brought in, they are right at my finger tips. Love it. Thanks for the useful information. I did not realize all google had to offer. I am going to start using some of these today! Brad - Good list of Google resources. I am going to have to look over the SEO one in great detail as it seems to have much more than I would have thought. Thanks! You have heard my opinion on the translator's before but I do agree if anyone can do it correctly Google can. I will have to get some friends to test a couple of the languages and see how it works out. Google Labs is very importang\t. Google loves to keep secrets and loves to provide things in beta. This is where you will find them. Good examples are Gmail and Desktop and Google World. All announced in beta here. Brad, you always come up with such great idea's! Thanks!! Great list! I love Google but didn't know about many of these. I too have been Googlized. I just set up Google Alerts this week and it works great. Brad-Great list! I just tried Picasa this week and LOVE it. So many tools, so little time! Good grief. I read this and realized that I know NOTHING. Phew. We are huge google fans around my office. Thank you, Brad, for the easy refernce to all the best products. Brad, what a great post! You are always providing such great tools, features and benefits to the Active Rain community! Thanks again for your hard work! You are succeeding in creating little gadget,widget and google obsessed bloggers ....Heeelllllppp I'm being sucked in! Great list, Brad. I learned a few things here. Always appreciate your sharing the techie stuff! Brad - Thanks for the complete list! This is great info. I was wonderig, though, are you on Google's payroll now? :) If not, they should be paying you for advertising their great products. Carol - google for you! :-) Always glad to see others benefit from what lies at the end of the rainbow! Roy - I have used analytics for the past 6 months, it's a fantastic tool for doing exactly what you said! John - that's why I posted this for you. Many have seen some, but most have not seen all. Jason - thanks, i appreciate that. I hope you can use some of these tools yourself. Some really cool tools. Jon - If you go to google labs, you'll know exactly what they are coming up with next. Labs is the one you want! Rolando - I like your choice of words "Exhaustive", this post took me 3 evenings and about 4 hours. Thanks! Joyce - you're very welcome, thanks for your comment. David and Kristin - I didn't either. That's why when I started researching this stuff, thought it would save other members and clients the time. James - I'll have to check that one out. I have always used the HTML code <meta NAME="robots" CONTENT="ALL"/><meta NAME="revisit-after" CONTENT="7 days"/> on my website and blog, this way I know when google and others are coming by. Thanks for the added tip! Dan - glad to help. Let me know which ones you decide to use, and what you think of them. I bet 18 out of 20. Ashley - glad you enjoyed this. As far as translators, I don't think it will ever be perfect, but Google will be the first and best to do it if and when they do. Jim - Google Labs has had many applications and widgets come from that lab. It's nice they let us beta, test and give input and feedback to all this great stuff. Trace - they're not always my ideas but thanks! I am usually inspired by comments, tasks during the day, or just another blog or post that makes me realize that some people just don't know about this stuff. Glad to share it! Dan - Googleized, I wonder if "Alerts" will pick that up? Also, I typed my name in a comment box today to see if it picks up comments too, or just posts. Hmmm...I'll let you know. Brad - as usual, great information. I use google services extensively, but I have learned a few new tricks in this post. Thanx. Awesome post... I amazed that some people aren't using these free tools (or even know of them). Tracy - your office sounds like they're on it! Google has so many other tools to offer too, these are just the ones I researched and that I use. Google rocks!! David - thanks for the nice comment, I'm glad that you appreciate the work that goes into these posts, it really does take time and quite a bit of effort to come up with this stuff. I hope they help you and your business! Janna - you are welcome, hope you enjoyed these! Ted - if you got one more tool you can use from this post, then it's a win-win for us both. Google has other tools you can use too, just ran out of time and room on this post to list them all. Maybe I'll do a sequel to this post in the future...once again, I'm out of time, gotta go to work and do my real job! LOL! Thanks for the comment! Vincent - me too! I believe there is so much technology available in our industry, that many just can't get their arms around it all. That's why I do these posts, hopefully to help those who aren't aware or just don't have the time to do the research. Thanks. Kate - AR is the place for everything you want or need. So many great writers, blogs, tools and information. It's a little world all in it's self. I learn something new or meet someone new everyday. What a fantastic industry network of great people and knowledge!! Let me know what you think of iGoogle?!? I've bookmarked this and given you a 5. Thanks, again, for your research and knowledge. Hey, that's a great list that you compiled. In addition I use another tool that I think is pretty neat. 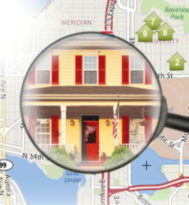 It uses Google Technology and allows you to specify what is OUTSIDE your listing (as against inside it). What's the best feature is that it allows my sellers to specify points of interest. So I just set up the listing and then invite the sellers and I'm done. But now I've started building Sets of Points of interest also, so I can re-use them for several of my listings. Brad I started my second blog on blogger. - Really great layout and professional looking. Google is a powerful tool all round. Brad, you are amazing! Thank you so much for the Google 'primer" as they used to call them! Seems like your posts are a must read! This is why I have not written much today. Gray is feeling "close". Patsy - bookmarks and high 5's are greatly appreciated!! :-) Thanks, i hope these links will be useful to you. Ok I'm back...looks like a cool sire, I entered in 2 mls numbers in my area, and nothing came back! All I got was a Kansas state line map with no data. Maybe I'm doing something wrong. Do you have to register and sign in to use it? David - you better let Gray go ahead and feel "Close"! LOL! Almost looks like our kitty Cleo who herself, is a Blogger as you can see! Thanks my friend, your comments are always great and appreciated....always!! Paul - I think Blogger is one of the better free Blog websites out there. I tried wordpress and liked it, but not as much as Blogger. Congrats on getting your blog started, google really does offer some great tools, websites, and services! Wow- lots of great stuff here. I will have to bookmark and take a look at Analytics again. Thanks! Yes, you do have to register at aroundpoint.com and then enter your MLS numbers. Or you can view one of mine, that I have already entered: 635310. Just go to arondPoint.com and enter the above MLS number in the view surroundings box on the left. Thanks Brad - This is great info...have a great and blessed weekend. Jill and Ron - Analytics is one of the best ways to track your website or blog. Some really great features and tools to help you maximize your page to your readers! Debra - thanks! I'm glad I was able to put these all in one-easy-to-access post for members just like yourself. I think you'll find each and every one of them to be useful in your business. George - my pleasure, you do the same my friend! Thanks!! Brad, Thanks for such a wealth of information and explanation! Renee - as long as you use it, then it was worth every effort. Thanks for commenting, have a great weekend!! Thanks so much for the tips. It is reallyh nice to have them all explained all in one place. I just started my own blog ob blogger....not sure of the exposure I'll get but hey its free...I also want to use a few of the others you mentioned. Brad, I have not been able to get Google Analytics to work on my AR blog, have you? I use it on all my other blogs and web sites. Neal - that's awesome, let me k now when your blogger blog is done, I'll support you on it and I'm sure others will too. Thanks, glad these may be useful for you! Joe - I have added it to "My Settings" in the description box and yes, it is working just fine. Great article - I found I use 10 of them on a regular basis and another 4 frequent enought ob e familiar. What you left off is the Google Documents and Google Calandar making the virtual office much closer than we many think. Brad, I keep hearing that google is coming out with an online office suite. Do you know where to go and see it in action? Wow! You will surely have me up all night now checking out all this great info! Thank You so much. Brad - thank you for the information. It's great and their are google tools on there that I am going to check out right away. Todd - thanks and you're welcome! Michael - man...you aren't kidding, this mutha took me a couple hours to post and days to research! Thanks! My goodness, that was one heck of an effort and extremely useful. I must admit I don't Google as much as I should, but I hope your list will encourage me to change my errant ways. We knew about some of Googles offerings but not all. We are off to check them out! Once again you have opened our eyes to so much more! We love reading your blogs and everyday we look forward to signing on to ActiveRain to see what else Brad Andersohn has to offer us RAINERS! Thanks so much for your contributions!!! Karen - I hope you will be encouraged to use more of the google array of tools, they really can help you and your business. Brad.... this is an awesome collection of so many tools on the internet and that Google has put together. Thanks for taking the time and sharing this. Brad, is it any wonder they call it "Google"? My head is spinning! Seriously though, I can't tell you enough how much I have learned and will continue to learn from your awesome posts! As a relatively new member of AR without a shred of previous blogging experience (ok, now thanks to you and the myriad of other committed AR member's help, I have developed a small thread!) I'd like to thank you for taking the time to continually post and share oodles of useful information! Jeff - thanks, we've missed you being around lately, hope all is ok with you and the family. Thanks for stoppin in and for the compliment. Boy that was enlightening. I have used a few google tools but you have laid them all out. I did not know about the Google Analytics or at least never looked into it before. After reading your blog, I have and look forward to the results. Steve - Google has some great tools that many of us are unaware of. I thought it would be nice to share some of the tools that have helped me and some of my clients on the web. The analytics is a very powerful script to include on your blogs, your websites, and even posts when you feel it necessary. Google is working on new stuff everyday, that's why I love Google Labs, you can see exactly what they are up to "realtime" and explore how the newest beta tools can benefit your business. Glad you found this post my friend, and thanks for your comment! Please come back and share your results! This is one of the best posts I have read. I can't wait to have my assistant, (who is tech-saavy) check out all of these resources. She can figure it all out in minutes, while it would take me a couple of years! Thank you, thank you! I did a search for Google Maps on AR and here you are - the perfect answers! Brad - Could we throw Google Hot Trends (http://www.google.com/trends) on the list? I have used this handy little tool to determine the "Hot Trends" (if you will) for a given date. Sometimes it is nice to know what the world is searching for and these trends can often be used to incorporate keywords into a blog. My little 2 cents! I personally use just about everyone of the Google Tools listed here. They really do know how to help out the internet user. As always a masterful blog! Your an open box of knowledge! Thanks Brad, it is nice for a "newbie" to be welcomed with such open arms. Brad - I was just going through some of your older posts. It's true goldmine! Come on Brad, don't be so modest. If ActiveRain is a goldmine (which it is) then your blog is the pure gold vein. Thanks for the tips. I use quite a few of these Google tools, but I amnot quite sure I knew so many existed! I will see if I can find more uses for some of these tools to make my life a little bit easier. Thanks again. Ryan - Brad can joke if he wants, but he gets more comments than I get readers - so he IS the man. Brad - Lets just say that you have a strong investment. Education is the best investment because it can't be stolen or lost. Thank you for investing in the community. Have a great weekend, and all the best to you!! Brad - We appreciate all that you bring to the table. Have a good weekend and good luck with your 49ers. Brad - The keyword for the 49ers should be points. Their offense is struggling right now. Hopefully they don't get that offense going until after the MNF game against the Hawks. Speaking of which, I told my girlfriend that she can come to that MNF game last night. I was just talking to Bob Stewart and we might meet up with him outside the stadium before the game. I have one extra ticket for a Hawks fan. Are you going to be in Seattle next weekend? What a great list, looks like any people appreciate you putting it together for us...thanks! Brad - Too bad. It's going to be fun. I just realized that the game is on Veterans Day, so hopefully the rush hour traffic won't be a killer getting to the game. Brad, thanks for sharing these google highlights. Google earth is my favorite. Brad: Thank you for some great information. I can't wait to check out Google Blogger. I've been looking for another "free" blogging site. Thanks again. Donna - Blogger.com has FREE Blogs and Yahoo has FREE Blogs at Wordpress.com. I have done of few of these at both sites. They both work pretty good! Thanks for the tips. A couple of them I haven't tried so I am going to add them to my list to go check out. Thanks for keeping on keeping on! Was that you Wendy C? :-) (Big Smile) if it was you, then you know I'm good! hahaha! If not, then I'm also Mr. Jack_ _ _!! Brad - I think I need to go back into your archives and read all your past posts. I need a slow rainy day to do that, though. Your information is so helpful to me. Your concise and it's easy for me to understand. Thank you. Brad, Brad.... how did I miss this? Thanks for the heads up. Good time to get a move on some of these - others I'll bookmark. 2008 is a time to be organized and resourceful. You really do a great job at providing great information. At times, you make it look too easy. Thanks for all you do! Thank you for your time and expertise. You are awesome and very generous. I'm 3 weeks into my new blogging website, and am addicted to it. Have a great 2008. Brad, Google Sketch is a nice free app to draw floorplans, etc on! I like the Google free Web Page Maker. You can put together some pretty nice web sites quick and them use them for inbound links to your web site to help with search engine optimization. I wouldn't use it for a business web site, but it's great for supporting pages. Rosemary - it's easy to miss any post with 63,000 plus members and thousands of posts! LOL!~ Be GR8 in 08! Ray - thanks, I try to make them as easy to understand as possible! Sometimes that's difficult as you're aware. Robert - another great Google tool to add to the list, thank you very much for sharing that on this post! Wow! I had no idea Google had THAT much! Great post Brad! Thank you for posting this. I "google" things all the time but I had no idea that Google had all of these other great tools to offer. I am in the process of having a website developed for me and trying to learn all that I can about making a statement online. These will come in handy! Thanks Brad, we knew of most of theses but you surprised us with a couple that we didn't know about. Thanks for the great info! Patty and Scott - it's like any great site out there, you just have to keep checking in with Google to see what they are up to next. They are just like us, always trying to come up with useful information for their viewers. New and fresh ideas and content is one thing you can count on from Google and from my blog! Thanks for stopping by and especially for taking the time to comment! I'm glad this one surfaced again, I've been finding out about Google tools here and there but this helps with them all in one spot. I'll take note of your comment above. Bob - glad you found this one. When I wrote it, I thought it was the most valuable post I'd ever write. Might still be! LOL! These really are some great tools for ANY business, but especially for Bloggers in REal Estate! Hope it brings you some added value, and doesn't take away from you having a wonderful weekend! Enjoy my friend! Tom - google is a great resource and has so much to offer to help your business, I hope you'll use these tools and services to their fullest. You should see some of the stuff they have added since I did this post! OMG!! I may need to do a new one called: 40 Google Tools for your Business! Thanks for sharing, I use some, and have not heard of a few. Thanks for the comment, the new google stuff is very cool, I noticed you weren't logged in when you commented, so I'm not sure who I'm thanking. :-)) But thanks anyway! Great posting with valuable information. In the web world it seems if your not on Google your not on line. As usual great information. Thank you. Kevin - thanks, great to see you back at the blog front. It's only great information if you use it and it benefits. Brad - 8 months later and this post is still relevant! I'm trying to take advantage of all the google tools but there are so many! I am already inserting Google Analytics onto various websites, it's been about a month so I should have some data now. We'll see how helpful they are. Hi Bo - did you know, 8 months later, there's probably 10 new tools I could should add to this post? Google has provided some awesome tools and they continue to add more to the toolbox. It will be great to come back to this post in 8 more months and see all the NEW things google will be doing for our internet business then. Let me know how the analytics on your sites is working out for you. I have been using several of these tools for a few months and find them to be very good. They appear to be replacing MS-Office online. Thanks for the additional information. I already have a couple of outside blogs but had inspiration yesterday for a new one - so I will check out blogger. Also, I love google analytics . . . You always have the best information for us!!! Good afternoon Brad! Great post as usual. You stay killin this website! Keep up the good work! Sharon - you might want to wait and see what AR is announcing this next month before you do anything. You will be very happy when you here about some of the really cool stuff we'll be doing in the rain for you. Hmmmm..... I think that's all I'm allowed to say. :-) Thanks for your kind words. There you have it folks Brad has confirmed AR will be releasing public blogs next month! Hi Brad. I knew about a great deal of these but there's always something new. I figure if I continue chipping away and do a little bit today, a little more tomorrow, etc, at some point I will have the best website I can possibly have. And you've helped me out! Thanks again! Thank you for the excellent info! I have not been in RE that long and I am still learning! I hope to use them soon. I have already but in my calendar for one full day of just playing with my website. Thanks again! Take Care & Have a Great '08! I'm a daily "Google-er" and also use AdWords, but this is some great info -- thank you! WoW Brad... another older Blog has made its way back around... As always... Great information .... even today ! So much to read and do but I'm going to work on using these tools. THank you! Google is a monster with many heads. The real power of Google is when you click more. It is marvelous that a simple looking screen could hide so much treasure. I have a lot to learn from Google! It's a great resource. It's been said that "Google Rules the World!" You have definitely helped shed some light as to why that may be so. Thanks for the enlightenment. Thanks for the amazing information. I'm very new to AR and and most of the Google tools you talked about are also new to me. I have so much to learn, it is overwhelming. But I have figured out that your blogs are one of the best places to learn. I will definitely search out all your blogs!! Once again, I am surprised by another one of your blogs. The more I dive into AR, the more I am seeing your blogs. I never knew that Google had so much to offer. I am definately checking out most of these tools, as my website, SEO, AR Profile and Blog (as soon as I write one) are all in need of some sprucing up, and I am new to all this stuff. Brad - More stuff to learn. I've only heard of about half of these tools and don't use and/or understand perhaps as much as I should. Hey Brad ~ Really good information as always from you. Lots of learning to be had here. This is giving me a lot to work on--my head is spinning. Thanks for this info. Brad as always, such great information that we all can use. thanks for sharing this with all of us! Brad, thanks for the info. I am really getting to like this internet marketing stuff.. I have had over 20 phone calls since joining AR a few weeks ago, and I have learned oooohhh so much. Patty - glad you are finding this information to be useful to you. Thomas - 20 phone calls is somewhat Ironic since this is a 20 tools post! haha. Congrats and good luck to you on AR! I think I missed this one.... thanks for linking to it in your other post. Jason - google is putting Microsoft in a very tough position. All the google tools can replace all the MS ones. i knew of some of the google services, but definitley not all of these. thanks entireley for all the new information. Dominic - if you think this was a lot, look at the date I posted this. Want to see an update of what Google has available now? That was Google then, This is Google Now!!! Much more to it than I thought and I know I am not taking advantage as I should..
Brad, thanks for this post. THIS is the type of information which is so helpful. I'm not always exploring the google.com site itself, so finding these "hidden" nuggets doesn't happen in my daily visits to their main page. I'm on my way to check them out now! Howard - they have a ton more available now. Have fun on your surf! Wow! I knew about google earth and the translator, but had no idea that most of the rest of those tools were available. Thank you very much. Janice - what till you see all the other stuff google has added since I wrote this post. Just CLICK HERE if you want to see for yourself! :-)) Trust me, there are some awesome things on that link. Thank you for sharinf these great tools with the active rain community. I am exploring the google video. Nice tool!!! Brad, thanks for making this info available to the newbies. This is a great help. Gr8 advice Brad Thx 4 taking the time to post all this info! Thanks for all your great advice Brad. I thought I knew enough about Google and keyword tracking to get by. I'm a newbie to Active Rain with so much to learn and so little time, but you are making it easier. Thank you for sharing all the information. I have written down three you have suggested to do more research on. WOW...so much great information. Thank You! Brad-Thanks again for another great post. Brad-Great post, thanks for all the information. I'm amazed at what I've learned in the last few days. Thanks Brad for posting this and all that is available from Google. I had heard of a few but many I had not. Lee - just wait 3 months! lol~ You'll know it all! Jan - have fun exploring! thanks for the google list -- I have been using more and more of the tools. Just learned how to share a google calendar with others. Scott - the calendar feature is sweet, you can also embed google docs and stuff into your AR Blog, very cool. I too have recently discovered the features available from goggle. I've used gmail for over a year but recently discovered googlepages, adwords and anyalics. It has been very exciting using them. I appreciate all the help from AR. Eva- there are even more tools now than there were when I wrote this. Google is incredible! Ronelle - check out the Google Labs, that's where all the new and cool stuff is that's coming out or that they're working on. Thanks for this info Brad. Have not heard of a third of these but they seem to be helpful although there is so much stuff out there that it might take me weeks to figure out which ones are best. We now have "Google Talk" "Google News" and a google friend feed type thing. I would also check out Google Real Estate. I noticed that when I do a Postlets, it uploads to that. Looks like I have some studying/work to do! Thanks for the great post! I was looking for some guidance on how to strengthen my online marketing. This should certainly help. Joining ActiveRain was definitely the first step on the long journey. Thanks Brad and the rest of the Elves. Thank you Brad for the interesting info. This is good help for everybody. I will try some of the tools to help me on my new carreer in Real Estate. WOW! This is a lot of information. I have much to learn. Thanks for helping! This is def. a helpful tool. I've been working extremely hard making sure that my Home Staging business gets recognized on all the major search engines. Thanks alot for the information. Thank you for such an informative post. This is incredible information! Brad, all I can say is THANKS! This information is awesome and very helpful. You are THE community builder! I love reading your blog's! You a wealth of knowledge - Thank You!